George Truefitt, later 19th century. Single storey, 2-bay, former school and 2-storey, 3-bay former schoolhouse with oast house-style ventilators. Rough-faced, squared and snecked pink granite finely finished to margins. Sloping cills. E (ENTRANCE) ELEVATION: asymmetrical; 2-bay; bay to left blank; round-arched doorway to bay to right with timber door, bipartite window flanking to right; harled flat-roofed addition to outer right. N ELEVATION: asymmetrical; bay to left obscured by harled flat-roofed addition with boarded timber door to left flanked by 3 windows to right; quadripartite window breaking eaves to bay to right, flanked to left by lean-to with bipartite window to right return. S ELEVATION: near-symmetrical; 2-bay; window off-centre to left; quadripartite windows breaking eaves to outer left and right. Predominantly 15-pane metal windows with 3-pane top hoppers. Rosemary tiled paired pyramidal roofs with terracotta ridges and lead-capped pyramidal ventilators. Shouldered, coped, rough-faced granite wallhead stack to N with circular cans. Cast-iron rainwater goods. S (PRINCIPAL) ELEVATION: near-symmetrical; gabled bay advanced to centre, tripartite window off-centre to left of ground and 1st floors, ball finial to apex; tripartite windows to flanking bays to left and right. E ELEVATION: asymmetrical; tripartite window off-centre to right of 1st floor gablehead. N ELEVATION: asymmetrical; 3-bay; tripartite window to ground floor of bay to left; gabled bay advanced to centre with window off-centre to left of ground floor and tripartite window to 1st floor, boarded timber door with iron studs to left return; blank gabled bay advanced to outer right; gableted window to ridge. W ELEVATION: asymmetrical, 2-bay; 2 light window to ground floor of bay to left, quadripartite window to ground floor of gabled bay to right, tripartite window set in gablehead, piend-roofed dormer to attic floor of bay to left. Modern 2-pane timber casement windows. Rosemary tiled roof with terracotta ridge. Coped granite wallhead stacks with circular cans. Cast-iron rainwater goods. ANCILLARY STRUCTURE: single storey courtyard block extending to boundary walls to N of schoolhouse; squared and snecked pink rough-faced granite finely finished to margins. Irregularly placed boarded timber window and door openings. Piended rosemary tiled roof. Coped wallhead stacks. Cast-iron rainwater goods. Interior not seen 1998. PLAY SHED: single storey, 4-bay play shed to N of school. W Elevation: modern lean-to conservatory to centre; boarded timber door flanked by 2 windows to bay to left; vertically boarded infill surmounted by row of 4-pane widows to penultimate bay to right; bay to outer right open with column to outer angle. S Elevation: symmetrical; 2-bay; boundary wall advanced to centre, flanked by 2 open bays with columns to outer angles. E Elevation: asymmetrical; 2 vertically boarded infilled bays to centre surmounted by a row of 4-pane windows; bay to outer left open with column to outer angle; bay to outer right boarded timber door flanked to left and right by small windows. N Elevation: not seen 1998. Predominantly 4-pane and 2-pane timber windows. Rosemary tiled valley roof with terracotta ridge; cast-iron ventilator to centre of each ridge. Coped granite ridge stack with circular cans. Cast-iron and PVCu rainwater goods. GATES, GATEPIERS AND BOUNDARY WALLS: granite rubble and squared and snecked rough-faced granite boundary walls with rough-faced and pyramidal coping to all sides. Square plan coped gatepiers with half-spherical caps with ironwork pedestrian gate to S wall. Tooled memorial stone to SW angle reading "...VICTORIA QUEEN AND EMPRESS HAS REIGNED FOR 60 YEARS...1837-1897". The Glen Tanar Estate was originally a deer forest which was part of the Aboyne Castle Estate. In 1869 Sir William Cunliffe Brooks, a Manchester banker and MP, bought the estate from the 10th Marquis of Huntly. He employed Thomas Mawson to layout the garden and estate, George Truefitt as architect, and 250 masons to construct the buildings, built of granite quarried locally. Truefitt designed a variety of quirky, originally detailed buildings ranging from the wildly detailed rogue gothic house to simple tiny cottages. A sketch of the school, by George Truefitt exists in the Photo Album 194, in the NMRS, which is a scrapbook of his work in the area. 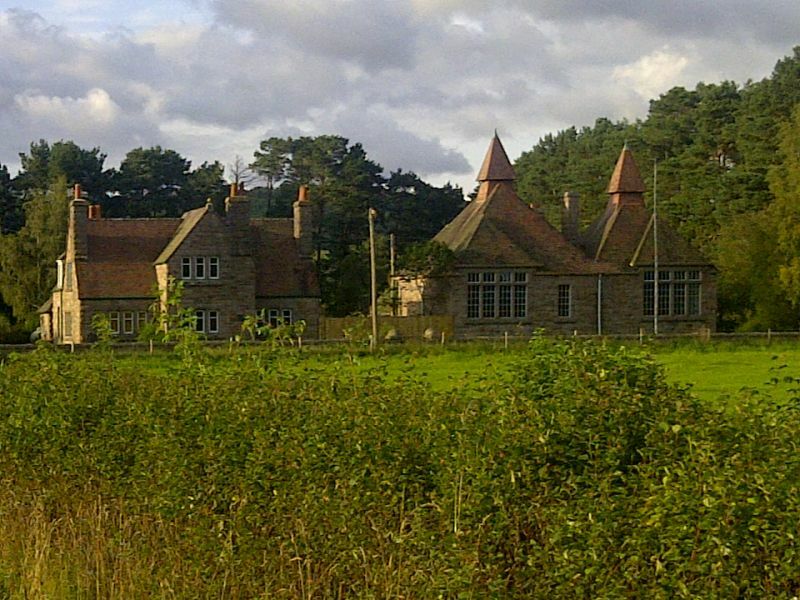 The design of the school is particularly unusual, being similar in appearance to English oast houses. The play shed survives with little alteration, the stone bays to the N presumably being the original toilet facilities.